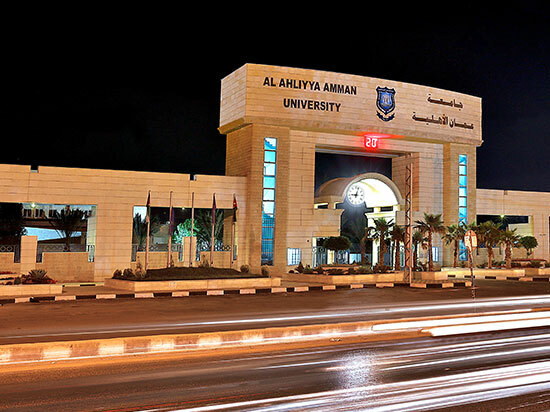 Al-Ahliyya Amman University shall be rated among the best Universities not only in Jordan but also in the Arab world. Excellence in providing teaching, learning and academic research with a high quality of international standards to enhance the status of Al-Ahliyya Amman University as the first private University in Jordan and in the Arab world, and to make it a preferred choice to students and researchers. This can be achieved by providing an academic environment that seeks excellence and by preparing qualified human cadres specialized in various fields of knowledge to meet the needs of society and the requirements of a sustainable development. Integrity: honesty and mutual trust between the University and all relevant authorities. Transparency: openness, clarity, and objectivity in all aspects of work. Loyalty and Citizenship: deepening loyalty to the homeland among members of the academic and administrative staffs and students. Diversity: accepting students and appointing academic faculty, administrative staff and dealing with all parties without discrimination on any basis. Cooperation: encouraging effective participatory teamwork in the University environment. Justice: achieving justice in dealing with the academic faculty, administrative staff and students. Accountability: accepting and taking responsibility for actions, decisions and policies related to governance and University management applied within the powers entrusted to each person working in the University according to his/her job.